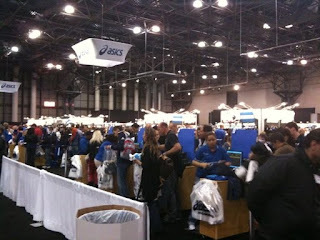 NY Marathon Expo - so many booths, so little time. I was thinking about my progress as a runner over the last year and I'm fairly pleased. I can't say that I'm completely satisfied with where I am because I think there's more that I could be doing to improve my level of conditioning. I had little trouble covering my 9 miles last Sunday in the marathon relay but I recall thinking during the race that I'd wished I'd done more hill and speed work prior to the event. I guess it comes down to why we run. There are those who get out and do intervals, tempos, fartleks and hill sprints once or twice a week. These people are probably much stronger for it and it helps them run paces that would seem unlikely or even impossible for a runner like myself. Every time I go out to run I think about training rigorously and while I do occasionally switch up my pacing my primary intention remains focused on the enjoyment of the experience. I went out this morning dressed for cold and I wasn't disappointed. After a slow start I picked up the pace in the middle and maintained it long enough to average 8:58 over 2.6 miles. It was fun to run at a quicker pace today but at other times comfort prevails. Yesterday was the first day of the NY Marathon Expo at the Jacob Javits Center in NYC. For those unfamiliar with Javits, it's a huge conference center on the west side in the 30's that, for some reason, was built far away from any public transportation. The closest subway will still require a 15 to 20 minute walk. The way the event planners get around this limitation is to run busses all day from local hotels. The buses are free and the system works. The only issue I have with it is that buses + mid day traffic = long wait times to get to the place. I anxiously checked my watch concerned that by the time I arrived I'd need to get back on another bus in order to return for a 2:00 meeting. As it happened I was able to spend about 40 minutes at the Expo. Upon arriving I was puzzled to see that the main event was a technology security conference which would normally be of interest. I couldn't see anything resembling a marathon expo. Finally, another person who was also looking spied the far away entrance and we headed over. The Expo was huge compared with any I'd seen before it. Every shoe, apparal, technology and health/exercise company had booths (although I don't recall seeing Nike which was fine with me). The ASICS booth was so huge it could have been an Expo on its own. I spent time talking with some people promoting their races, chatted with someone representing Newton running shoes and then headed back to the office with lots of pamphlets and a few samples. I wish I had more time to revisit the Expo today. I encourage anyone to go - it's free!